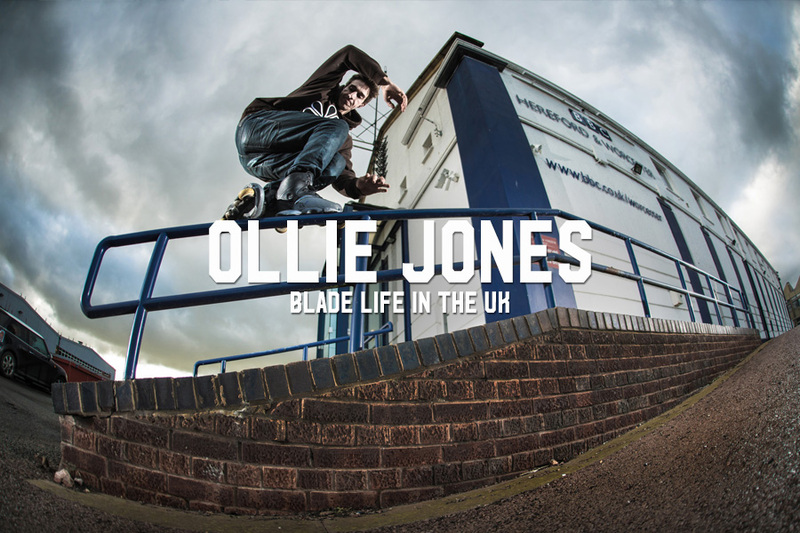 Ollie Jones likes to skate street and it shows. Not everyone can put together a street profile during a harsh English winter, but Ollie teamed up with Sam Cooper to do just that. A duo that has created photos seen in past ONE print mags, we were eager to see what these two could assemble when given proper time to let things play out at their natural pace. And as you’ll see the results are, as expected, striking. So, well done, gentlemen — your hard work has once again delivered the goods. Cheers! Hey Ollie, tell everyone who you are, where you live, and how old you are. Well, my name is Ollie Jones, I live in Cheltenham in England, and I am currently 31 years old. How many of those years have been on blades? 21, since 1997. I had recreational skates before then but I’m not completely sure when that was. Who got you into blading, and who/what kept you blading? I had a friend at school who I think had been on holiday somewhere, and had seen some demo event with Rich Taylor and other people. He had some photos from the day and we set about trying to learn a few tricks. What’s the blading scene like in your area? All street, or a mix of park as well? I guess that depends on how far you are willing to go to define the area. I might be the only person blading regularly in this town but I have plenty of people to skate with nearby and we are normally all out on the weekends. What about your preferred terrain? Street every time. We have a couple of quite fun concrete parks around here now, which we will skate quite regularly. Given the choice though, I would always prefer to be out looking for new stuff. How often do you get to shoot with Sam? Seems like you two have a track record of making some pretty strong images. Pretty often. He works quite far away now, during the week, but if it’s the weekend and we have an idea of something worth doing, then it will get done. It’s always a good time and we usually refuse to go home without getting something. Is he easy or hard to work with? It’s always easy. We will make a plan in the morning or the night before, and just go and do it. I am normally more up for taking chances as I am quite happy to skate in weather that will ruin the look of photos, so Sam is always trying to make me wait for a sunnier day to do something. Sometimes he will get me to do the trick more times than I really wanted to so that it looks right. Usually I’ll have my hand in front of my face, or the sun will go in at just the wrong time. Other times I am just too long to fit in the frame. Tell us about this photo shoot — were any of these tricks particularly, well, tricky? I would say that the tricks were probably the easiest part of the whole thing. We started in December and had to deal with Christmas getting in the way, the snowiest winter we’ve had in years with plenty of rain thrown in, and Sam being on the opposite side of the country five/six days out of seven. We also had ideas for specific types of spots that just completely failed to exist anywhere, travelled long distances to find something that would make it impossible to do what we had planned and have to reconsider, and also for the majority of the clips in the video we had to film them ourselves as it was just the two of us out. Thanks to Sam Davis and Si Coburn for filming the others though. What do you like to see in your own skating when looking back at clips or still images? The most common problem I have is that spots look quite big until I am skating them and then they look comically small. So if that doesn’t happen then it’s a bonus. For the actual tricks I just like to try and do them “properly.” So if your feet should be together then that’s how it has to be, or if it’s a trick that needs a grab then I better be doing it solidly. 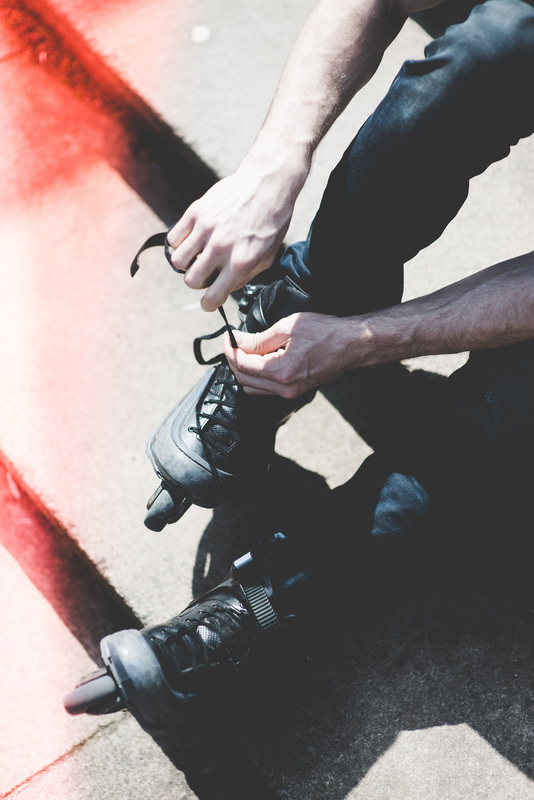 Who do you think best epitomizes that aesthetic in blading? The majority of people seem to go along with those principals now, but I have been held to those standards by always skating with people who are older than me…hahaha. Outside of skating what kinda stuff do you do and like? Exercise of all kinds are fun for me, so that’s what I spend a lot of time doing while I’m not skating. If I have time to waste on the train or waiting somewhere, I will usually have a book with me of some sort. Normally science or maths based. Ever had a chance to travel much? Get to the US? Traveling to skate is always good; seeing new places and finding new spots. I have been to several places in Europe to skate and of course all over the UK. I actually haven’t ever been to the US but I am going to look into making it to Blading Cup later this year. Thought about doing events like FISE? Do you skate well in comps? Not really. Park comps aren’t my thing at all. I really like skating street competitions and would like to go to more. They are always just big, fun sessions. Switch royales aren’t actually that hard hahaha. Any trick tips you wanna pass on to fellow skaters? Grab it before you lock on, not half way down. Also, learn to go fakie over both shoulders as soon as possible. How about Thank You’s or Shout Out’s? Thank you for this opportunity, thanks to Cooper for doing the hard yards to make this happen. 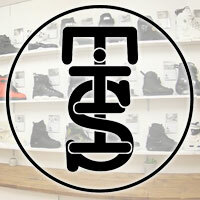 Thanks to BHC Wheels, Remedyz and Slaptap Skateshop for supporting. Hi to my family and thanks to all my friends who continue to broaden my horizons. They know who they are and they know what it means. Well thanks again, Oliie! Great work as usual — we look forward to seeing more.